I am interested in nutrient cycling and how living things can influence nutrient availability within ecosystems. I work primarily with old-field arthropod and microbial communities and explore their direct and indirect impacts on nitrogen cycling. I am particularly focused on detritivores, such as earthworms and isopods, and their predators. The goals of my research on detritivores are to understand the mechanisms through which detritivores influence nitrogen cycling (e.g. physical breakdown of leaf litter, grazing on the soil microbial community) and to try and predict the influence of different detritivores based on these mechanisms. I am using theoretical models in this project to 1) gain a mechanistic insight into effects of species on nutrient cycling and 2) predict the influence of animal species across large spatial and temporal gradients. These models track the follow of elements, such as carbon and nitrogen, through the ecosystem and allow us to predict how animal might influence their movement. For soil microbial communities, I am particularly interested in the most effective method for modeling their influence on soil carbon and nitrogen cycling. Microbial models have become an important component of large-scale climate models aimed a predicating the influence of anthropogenic activities, such as carbon emissions, on the planet. I endeavor to test the predictions of these models across different nutrient availability gradients. My scientific career began in late high school when I became interested in measuring the concentrations of BPA leaching out of Nalgene bottles. My BPA study yielded encouraging results, and I continued research in the field of toxicology with Dr. Maggie Xenopoulos. My research focused on the impacts of nanoparticles on nitrogen cycling in streams. During my third year of university, I measured the performance of a common fungal species (Tricodema ressi) on different carbon substrates with Dr. Mehdi Dashtban and Dr. Wensheng Qin at Lakehead University. 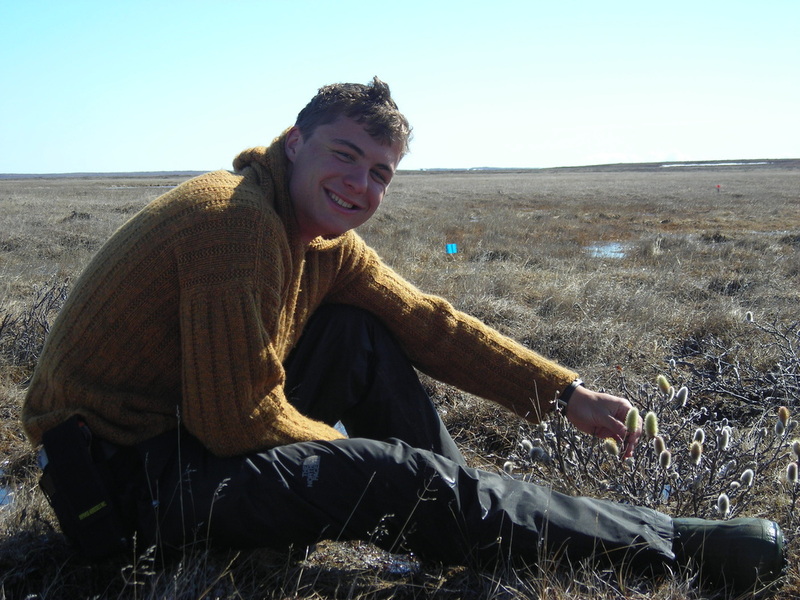 For my fourth year thesis, I examined the impact of climate change on the annual growth of arctic shrubs (Salix richardsonii) with Dr. Douglas Morris. For my Master’s thesis at the Yale School of Forestry & Environmental Studies, I conducted two experiments aimed at understanding the role of living things in the nitrogen cycle. My first experiment tested the predictions of a microbial model that predicts carbon and nitrogen cycling under different resource environments. I found that the model predictions were very accurate and determined that the accuracy of these predictions was driven by the characterization of microbial nutrient demands (i.e. their stoichiometry). In my second experiment, I manipulated the presence of arthropod species feeding in the plant- and detritus-based food chains. I found that plant-based species had a strong positive effect on the nitrogen cycling potential of the soil microbial community, while detritus-based species negated this positive influence. Buchkowski, R.W., C.J. Williams, J. Kelly, G. Veinot, and M.A. Xenopoulos. 2015. Nanosilver and Nano Zero-Valent Iron Exposure Affects Nutrient Exchange Across the Sediment-Water Interface. Bulletin of Environmental Contamination and Toxicology: 1-7. Buchkowski, R.W., O.J. Schmitz, and M.A. Bradford. 2015. Microbial stoichiometry overrides biomass as a regulator of soil carbon and nitrogen cycling. Ecology 96(4): 1139-1149. Schmitz, O.J., R.W. Buchkowski, K.T. Burghardt, and C.M. Donihue. 2015. Functional traits and trait-mediated interactions: Connecting community-level interactions with ecosystem functioning. Advances in Ecological Research. doi: 10.1016/bs.aecr.2015.01.003. Buchkowski, R.W., O.J. Schmitz, and M.A. Bradford. 2014. Microbial stoichiometry overrides biomass as a regulator of soil carbon and nitrogen cycling. Ecology. Dashtban, M., R. Buchkowski, and W. Qin. 2011. Effect of different carbon sources on cellulase production by Hypocrea jecorina (Trichoderma reesei) strains. International Journal of Biochemistry and Molecular Biology 2(3) 274. 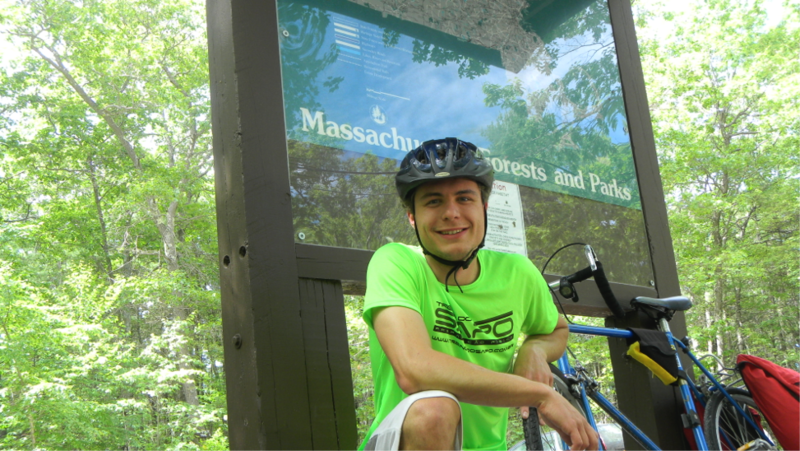 Bicycling around our field sites in Northeastern Connecticut. 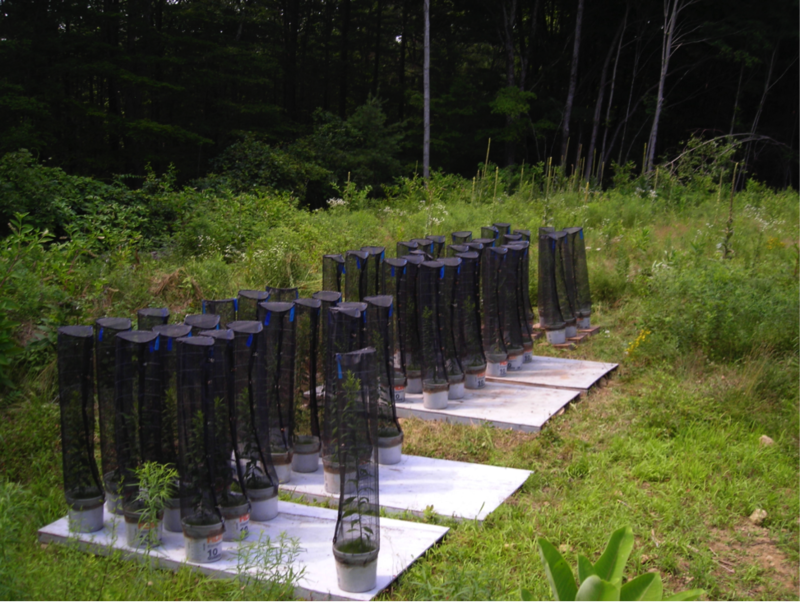 Mesocosms used to study the influence of plant-based and detritus-based species on nitrogen cycling. 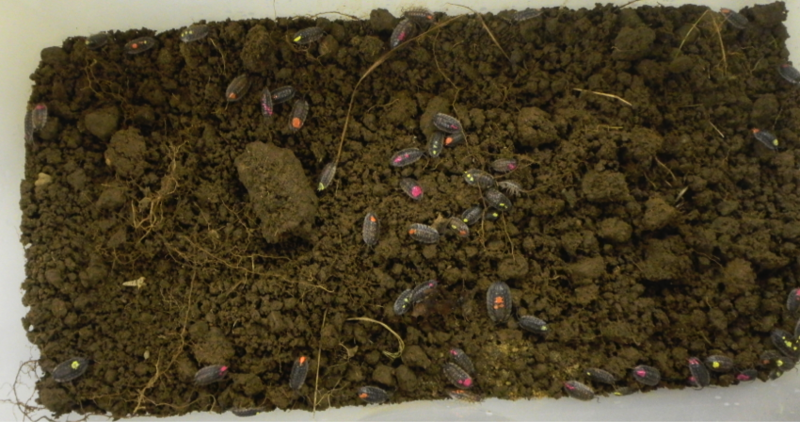 Isopods identified by a colored mark before being added to experimental mesocosms.